In one of our first travel posts, Spot Cool Stuff took a look at the best wheeled convertible backpacks. 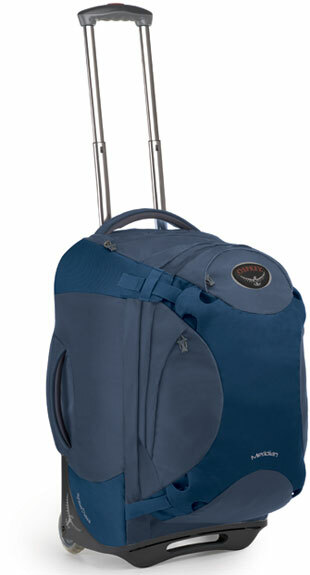 Wheeled convertible backpacks are hybrids between an overnight hiker’s backpack and a rolling suitcase like so many travelers wheel through airports. Having such luggage versatility can be hugely helpful on trips that mix luxury and outdoor travel. Heading to Thailand, for example, you may well want a backpack for roaming across beaches and through mountain jungles but wish for a wheeled bag to navigate the airport and for when you arrive at your luxury Bangkok hotel at the end of your trip. 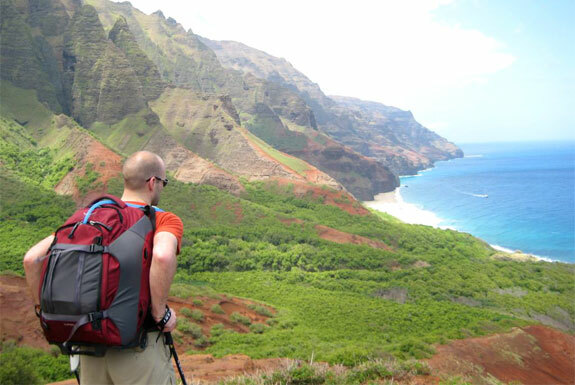 When we originally did our wheel convertible backpack review we concluded that the best model was made by Osprey. In light of our own pending trip to Thailand we thought we’d reexamine that review. What we found is that now Osprey does not make one of the best wheeled backpack. They make two of them: the Osprey Meridian and the Osprey Sojourn. The reason why Osprey wheeled backpacks remain so superlative hasn’t changed: Their packs feature a rugged backpack frame. The problem with most wheeled backpacks is that they are primarily wheeled suitcases with backpack straps tacked onto them seemingly as an afterthought. (Not to pick on anyone but, yeah, the Eagle Creek Switchback falls into this category). 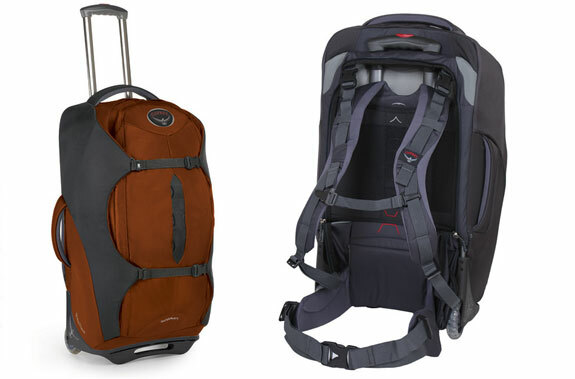 In contrast, the hiking frame and accompanying deluxe suspension system is integrated into an Osprey hybrid pack. That makes them very durable and comfortable to wear as backpacks. A ventilation system keeps your back from getting sweaty, especially when the weight-distributing hip strap is used. Spot Cool Stuff has personally taken the Meridian on a five day trek in Nepal. Of course, both these Osprey bags make for good wheeled suitcases too. Of special note are the large “off-road wheels” (if such a thing can be said to be a bag feature), which provide provide high ground clearance. Airlines are not legally responsible for any damages they inflict upon your backpack if your bag has any loose straps dangling from it. The logic being that you are at fault since airport conveyor belts are not made for backpacks. With the Osprey Meridian and Sojourn all the backpack straps tuck securely inside the bag’s sealable back pocket. So you’ll get the full reimbursement if when an airline damages your Osprey convertible bags. • Cool slide-down plastic display for a business card or luggage tag. The major difference between the Osprey Meridian and the Sojourn is that the former includes a detachable daypack. In our original review we noted how the Meridian’s daypack had an opening so small as to render nearly useless. Happily Osprey listen to us—at least, we like to assume we have such sway over companies—and redesigned the daypack on their latest Meridian. The new daypack is excellent. It features a laptop sleeve (perfectly sized for a 15.4″ MacBook Pro), iPod pocket and side water bottle compartment. The daypack is securely attached to the Meridan via a zipper and large clips. Two sizes are Meridan are available: a 22-inch that holds 60 liters of gear and a 28-inch that holds 75 liters. Both sizes squeeze in the overhead compartments of standard sized jetliners, though if your pack is stuffed full you’ll probably have to remove the daypack to make it fit. Sadly, we are not particularly thrilled with the Meridian’s three color options: black, alpine blue and lichen (olive green). First, the Sojourn’s backpack suspension system—the shoulder harnesses and hip belt—are removable. That saves weight and increases storage space on trips for which you only need a rolling bag. Second, because all the Sojourn’s storage space is in the main compartment (and not divided between the main pack and a daypack) it is more efficient. Finally, the Sojourn sports a more interesting set of color choices than does the Meridian: earthy-brown, charcoal and (our fave) pepper-orange. The Osprey Sojourn is available in a 25-inch model that holds 60 liters of gear and a 28-inch that holds 80 liters. Not incidentally, if you are looking for a wheeled bag that does not double as a backpack, check out our review of the ultra lightweight Osprey Ozone. Excelent review! I’ve been looking all over the internet for Meridian vs Sojourn reviews as I was having a hard time deciding which to buy. 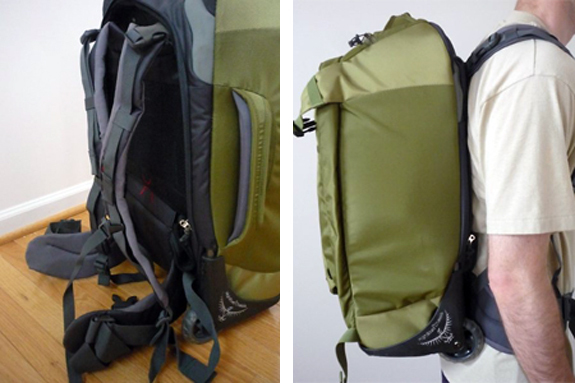 I think I will go for Sojourn 60 L and I will also buy Ospreye daylite backpack that can be attached to Sojourn. Best of both worlds, cheers!